This week’s content is brought to you by Adam Augusiak-Boro. 1. Data as of 12/18/18. “FAANG” measures the market-cap weighted performance of Facebook, Apple, Amazon, Netflix and Alphabet (Google parent). “2018 Tech IPOs” measures the market-cap weighted performance of all tech companies that went public in 2018 in the US. It seems that the market volatility that began in October has followed us almost to the end of the year. As I write this newsletter, the three most-followed indices in US stock markets—the NASDAQ Composite, S&P 500 and Dow Jones Industrial Average—are more than halfway to a bear market, which is often defined as a 20% decline from a peak based on market close. In the last three months, the NASDAQ Composite, S&P 500 and Dow Jones Industrial Average have fallen 15%, 13% and 11%, respectively. Similar to prior months, concerns over tariffs arising from the USA-China trade dispute as well as an expected slowdown in global economic growth continue to worry investors and drive the market lower. Feeling the concern over the trade dispute, China’s Shanghai Composite and Hong Kong’s Hang Seng lead major stock indices in declines, falling approximately 30% and 26%, respectively, from their peak. However, despite the concerns highlighted above, losses over the course of the last year have actually been relatively modest. Through today, the S&P 500 and the Dow Jones Industrial Average are down only 4.8% and 4.6%, respectively, for the year. 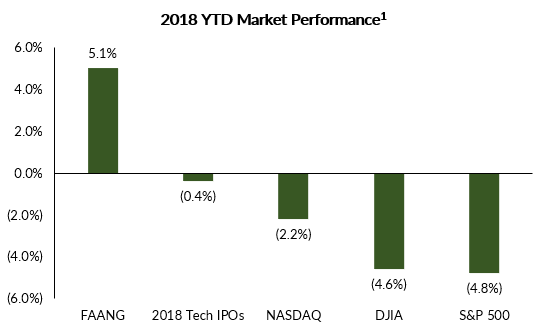 Moreover, the tech-heavy NASDAQ Composite is down only 2.2% year to date, and the tech giants comprising the FAANG companies are actually still up over 5% for the year. At EquityZen, we also took a closer look at the tech companies that went public this year and how they have performed to date. The nearly 50 companies that debuted on US exchanges this year, raising over $28 billion cumulatively, are essentially break-even for the year, having fallen just 0.4% from the date of their IPOs. Again, despite volatility, 2018 was also a relatively strong year for large tech IPOs. According to the Wall Street Journal, the number of tech companies valued at $1 billion or more at the time of their IPO reached its highest level since the dot-com boom. 37 such companies made their public debuts this year, compared to 22 in 2017 and only 7 in 2016. While 2018’s performance is still a far cry from 2000’s peak of 63 unicorn IPOs, the dot-com era obviously did not bode well for the tech industry and the economy as a whole, so I welcome a more restrained yet relatively robust IPO market. The startup and tech ecosystems are also radically different today than in prior bull markets—the typical tech IPO candidate today has likely raised hundreds of millions in private capital, generates over $100 million in revenue and is 10+ years old. While the jury’s still out on how today’s private unicorns will perform in the public markets (I’m looking at you Uber), years of easy private capital has led to strong balance sheets and proven business models that are arguably in a much better position to withstand a market downturn than prior generations of startups. As we look ahead to 2019, we’re reminded that 2018 was a year much like any other in terms of investing. Some investments have performed poorly while some have performed well. For example, while unicorn IPOs from ADT (down 46% YTD) and Dropbox (down 24% YTD) have been followed by less than stellar market performance, companies like Zscaler (up 139% YTD) and Ceridian (up 54% YTD) continue to provide strong returns to investors. Only time will tell if we’re at the beginning of a sustained downturn—but until then, we’re trying not to let recent market volatility cloud the big picture.